Leading OEM Manufacturer of zeta carbon activated carbon cartridges, nano shield ldc filter capsules, nano shield mdc filter capsules, photo shield filter capsules, ptfe filter cartridge and centrifugal sewage pumps from Surat. The activated carbon is made into ZetaCarbon filter media with the addition of cellulose fibers and a positively charged resin. This eliminates the use of bulk carbon that causes dust-related issues especially for operators. Figure 1 shows activated carbon and ZetaCarbon medium. CUNO offers a range of ZetaCarbon products for laboratory-scale filtration, for process development scale-up work, and for small lot production runs all the way to full scale. Biocap® 25, 1000 and 2000 disposable devices have surface areas of 25 cm2 through to 1700 cm2 enabling development to scale-up. In addition ZetaCarbon discs (47 mm and 90 mm) are available. CUNO incorporates five standard types of activated carbon to cover a broad range of applications. These have been specifically selected for their properties to meet industry requirements. ZetaCarbon filter media are also available in different porosities so that solutions with different viscosities can be processed. Adsorption of molecules by activated carbon relies on Van der Waals' forces. As those interactions are of short range, contact time between the solution and the filter media is critical. Graph 1 shows the influence of the flux on the adsorption capacity of the filter media. It shows that when the flux increases the adsorption capacity of ZetaCarbon filter media decreases. 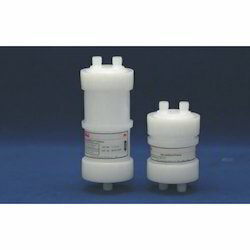 Nano Shield LDC filter capsules have been specially designed to combine the highest level of particle retention with superior flow rates and minimal pressure drop for demanding high viscosity chemical applications. 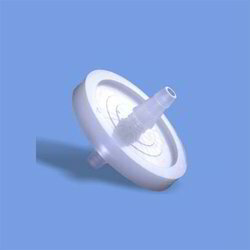 Utilizing Hollow Fiber Technology (HFT), Nano shield filters are able to deliver superior flow with minimal pressure drop, while maintaining the highest level of filter efficiency in a small disposable design. All filters are critically cleaned, integrity tested, and rinsed with high purity water to provide fast start-up times and low extractables right out of the box. 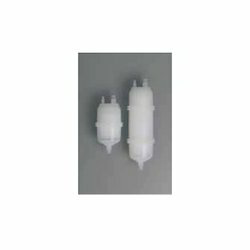 The small compact design of Nano shield LDC filter capsules make them ideally suited for critical applications requiring low hold-up volume with superior flow rates and high particle retention at 0.01, 0.02, 0.05, and 0.1 µm. Nanoshield Capsule Construction The filters polypropylene and polyethylene materials of construction combined with quality manufacturing ensure that ionic, organic, and metallic contaminants are not being added back into the process fluid. 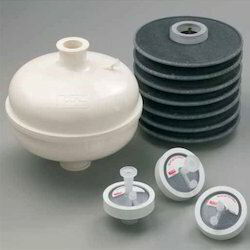 Ionic, organic, and metallic contaminants can extract from surface modified and or improperly manufactured filters, which may reduce shelf life and or change the photo-speed, viscosity, or molecular weight of the photo-chemical. The small compact design of Nano Shield MDC filter capsules make them ideally suited for applications requiring low hold-up volume with superior flow rates and high particle retention at 0.01, 0.02, 0.05, and 0.1 µm. Manufactured in a clean room environment from polypropylene and polyethylene materials, NanoSHIELD capsules will not contribute to ionic, organic, and metallic contaminant levels in the process fluid. Ionic, organic, and metallic contaminants can extract from surface modified and or improperly manufactured filters, which may reduce shelf life, or change the photo-speed and molecular weight of the photo-chemical. NanoSHIELD MDC capsules are critically cleaned, integrity tested, and rinsed with 18 meg ohm DI water to minimize extractables and allow process repeatability out of the box. 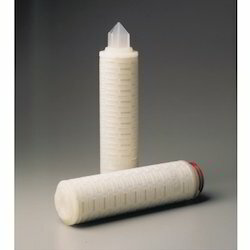 Photo Shield Filter Capsules are highly retentive membrane filters designed to meet the exacting requirements of photoresist and an cillary chemical applications. The naturally hydrophilic Nylon 6,6 membrane does not require pre-wetting and system flushing, thereby eliminating a potential source of contamination and chemical interaction, while reducing hazardous waste disposal. These low hold-up volume filter capsules allow material suppliers to assess parameters such as material compatibility, photo-speed, and particle retention testing in a rapid and cost effective manner. PhotoSHIELD 50 mm filter capsules contain the same filter media as full size PhotoSHIELD filter cartridges and capsules, ensuring a consistent level of membrane quality throughout laboratory, pilot, and full-scale product ion testing (see CUNO bro chure LITCPSLD1 for more information). PhotoSHIELD 50 mm filter capsules are ideally suited for photoresist and an cillary chemical applications where high efficiency contaminant removal at 0.04 µm, 0.1 µm, or 0.2 µm is required. Microfluor FP 0.20 filter cartridges have passed the most comprehensive validation program to the industry. Bacteria retention in liquids has been demonstrated by the ASTM Challenge Procedure at 107 organisms/cm2 of filter area. Bacteria retention in gases has been demonstrated by an Aerosol Challenge at 105 organisms/cm2 with a flow rate of 0.70 SCFM/ft2 over a six hour challenge period. Test results and challenge protocols of the validation test program are presented in the Validation Guide for Microfluor Cartridges. This extensive Validation Guide is available on request. The compatibility listing in Table 1 is intended as a guide. It is recommended that compatibility of these chemicals be established under actual filtration temperatures and conditions since operating parameters will affect compatibility. Consideration must also be given in selection of suitable gasket materials to assure complete compatibility. All data is shown at 20o C unless otherwise stated. All solutions were concentrated unless otherwise noted. These 12 supplementary toxicity and biocompatibility tests confirm that the Microfluor cartridge is non-toxic, non-immunogenic, and non-mutagenic. The Biological Safety Report for Microfluor cartridges is available upon request. Looking for Industrial Fluid Processing ?